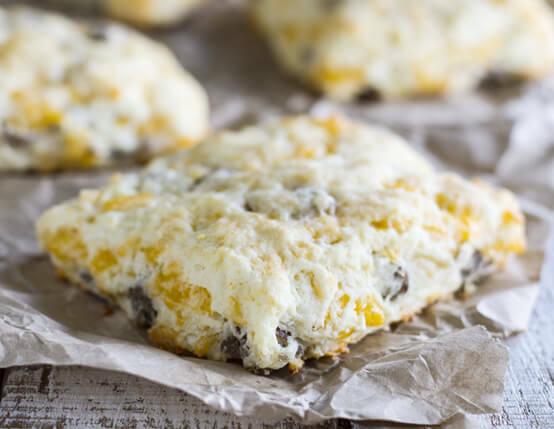 Perfect for breakfast on the run, this breakfast sausage and cheese biscuit recipe has all the goodness of breakfast combined into one tender biscuit. This recipe is made with Jones Golden Brown® Maple Links. In bowl, stir together flour, baking powder, salt and sugar. Cut in butter with fork or pastry cutter until mixture resembles coarse meal. Stir in cheese and chopped sausage. Pour in milk and stir just until it pulls away from sides of bowl. Pour mixture onto work surface dusted with flour. Knead just until it comes together - dough will be sticky. Pat into a rectangle 10-1/2x7-inches. Cut into 6 squares. Place biscuits on ungreased baking sheet. Bake for 13 to 15 minutes, or until lightly browned. Brush with melted butter. I double the cheese and sausage. Put a fried egg on top. Yum!